Stoke Park is a prestigious leisure and sports club located near Stoke Poges, close to the Bucks / Berks border. Pianist Simon Jordan has played there many times for weddings of various sizes. Simon is a highly experienced musician playing at weddings and events. 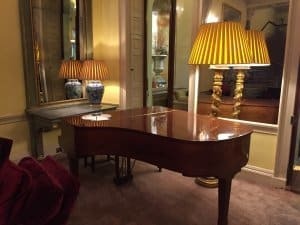 Based in nearby High Wycombe, Simon has played Stoke Park’s beautiful Bluthner concert grand piano many times and is the ideal choice to entertain your guests before, during and after your ceremony, for your wedding breakfast or drinks reception. Simon was educated at the Royal Academy of Music and has played for the Prime Minister’s annual Christmas party, for royalty, as a soloist at the Royal Festival Hall, and on tour around Europe. He is a former Radio 3 and Radio 2 producer and is at home playing everything from Bach to Beyonce to Bollywood. This is best illustrated by one of his most recent performances at Stoke Park – the music requested by the bride is below.